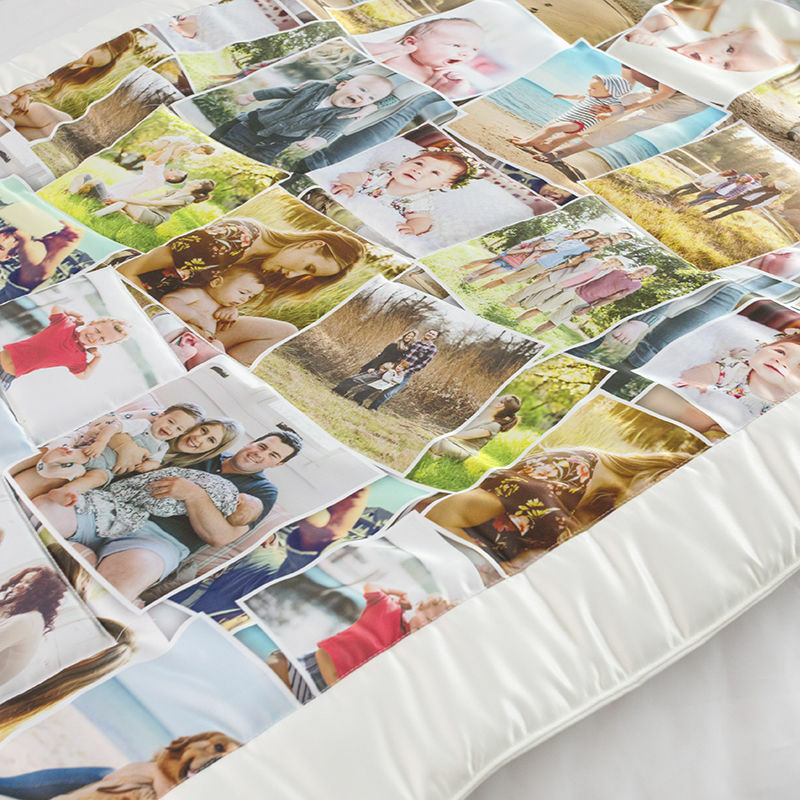 Create a luxurious item and perfect gift with our hand printed handcrafted photo quilt. A personalized photo quilt is a great way to show special memories. These custom made quilts are exceptional quality and become the best photo memory quilts. Generate a collage on a quilt using our photo collage maker in our easy to use design tool. The photo printing is exceptional and the finished quilt comes in a duchess satin bag with a tie perfect for gifting. Make an exceptional quality memory collage quilt using your photos and ideas, of which get turned into this wonderful one-of-a-kind creation. Made by hand by Bags of Love's highly skilled printers and seamstresses, your impeccable memory photo quilt can be in your hands in a matter of days. This is a great way for someone wondering how to make a photo quilt - let us do it for you in exceptional quality and made in a few days. What someone would do in weeks, we can do in days, and as a gift is it an exceptional reveal on opening the satin bag with tie containing the memory quilt with pictures. i bought a quilt as a gift for my daughter's bridal shower in South Africa and i cannot stop looking at it, the perfection of the collage and sowing stitches its so amazing. you know your work very well and i am very impressed thank you. Hello, My quilt is absolutely beautiful! It is amazing. I had 60 pictures scattered on a 39 X 39 quilt and every single picture is perfect. This is the first time I ordered from Bags of Love and it was worth every penny, I will definitely order from Bags of Love again. I highly recommend Bags of Love! Thank you for offering this product and service. This item was ordered for an employee of our organization as a gift for her service. She loved it! I was very happy with the end result. We created a quilt as a retirement gift for someone who had been with us for a very long time. The final product was beautiful and the turn around time was FAST! The personalized photo quilt comes complete in a satin bag ideal for giving and allowing a perfect reveal for the creation. The color that you choose for the back of your photo patchwork quilt will also be used for the border on the front. Choose from lilac, ivory or pink, selecting the best color to complement your design. The border is a classic design feature of a patchwork photo quilt and gives your quilt a homemade charm. To recreate the look of a patchwork quilt, choose to make a photo collage where you can print loads of your favorite snaps. It's a contemporary alternative to traditional patchwork style blankets. Simply upload your photos and select more than 1 in the design interface. Here you'll be able to choose from ready-made montage styles or rearrange the photos manually to create your own. Making a quilt is a sheer joy anyway, but when you get to design one here, there is even more fun and creativity to be enjoyed. Try making a photo collage quilt and use a great selection of photos to build a collage design you can cherish for years, if not generations. To do this, press 'start design' and upload your photo selection. We have an automatic collage maker that generates a collage on your quilt for you. You can even have a heart collage quilt using our automatic heart collage generator. You can choose the best version before you buy and know for sure what it will look like. Try it out now, it's fun and free to try. A personalized quilt is also perfect as a gift for the bedroom. The custom photo quilt is such a beautiful item that it will surely brighten up any room. Our personalized quilts make lovely gifts, as they are warm and absolutely beautiful. Everyone in the family will enjoy one and they will be sure to keep the quilt for ages, passing it on through generations. A personalized quilt makes a great keepsake. Our photo collage patchwork personalized quilts are one of our most popular gifts, and it is a product we are especially proud of. Because we hand print and stitch our patchwork quilts, we can create a fantastic quilt that will last for generations - a great way to make a family heirloom for those families where no one has the fingers for sewing photo memory quilt patterns - we do it for you. Care Instructions: Dry clean only. Do not put in washing machine or tumble dryer. Surface wash okay with mild soapy water. Do not use abrasive rubbing. 10 years guarantee on print, material and stitching finish, but it will last generations. Personalized photo quilts are handmade to order, by our expert seamstresses. We use a specialist printing process that fuses the ink to the satin fibers, so your designs won't fade, scratch off or peel away. The print is striking, with an almost HD finish. We print your designs onto a piece of Duchess satin fabric and print another piece with your chosen backing color. Thick, sumptuous padding is inserted before the two pieces are hand sewn together with mitered corners (to create the border), so your photo quilts are a real example of artisan craftsmanship. The color that you choose for the back of your photo patchwork quilt will also be used for the border on the front. Choose from lilac, ivory or pink, selecting the best color to complement your design. The border is a classic design feature of a patchwork photo quilt and gives your quilt a homemade charm. To recreate the look of a patchwork quilt, choose to make a photo collage where you can print loads of your favorite snaps. It's a contemporary alternative to traditional patchwork style blankets. Simply upload your photos and select more than one in the design interface. Here you'll be able to choose from ready-made montage styles or rearrange the photos manually to create your own.